The Champlain Valley Unitarian Universalist Society (CVUUS) strives to ensure the personal safety of all persons involved in CVUUS activities. This document identifies particular safety concerns, and establishes broad policy guidelines for dealing with each. Additional, more specific policies may be needed to implement these guidelines. 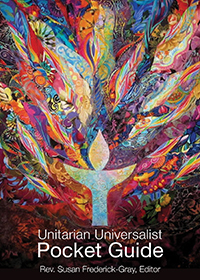 As a liberal religious organization, CVUUS is a welcoming, trusting institution in which individuals grapple both publicly and privately with deep, intimate matters that arise on the path of spiritual growth. That situation places strong demands on CVUUS to maintain an atmosphere in which individuals may assume that trust, honesty, and goodwill prevail. At the same time, CVUUS recognizes that, because of these very qualities, the institution is especially vulnerable to individuals whose purposes or behaviors run counter to the basic principles of CVUUS and of our denomination. Nothing in these policy guidelines is intended to prohibit or discourage either free and open statements of opinion on religious or any other matters, or civil debate among individuals and groups with divergent views. The CVUUS Safe Congregation Policy includes two major components, both essential in providing each CVUUS participant with a sense of personal safety. It is not enough that CVUUS state these policy components; the institution must also take active steps to ensure that policies are always implemented, and that such implementation is thoroughly documented as appropriate. As members and friends of CVUUS, we are all stewards of the congregation. In this role, it is our hope and responsibility to protect others from harm. In order to prevent harmful circumstances or events, it is important that we be clear about our expectations of behavior toward one another and that we continuously keep ourselves aware of what allows us to be a safe congregation. Our children and youth will covenant, with guidance from their leaders within their individual Religious Exploration Groups, regarding safe behavior. These covenants shall be posted in the RE Building. In this way, they can be reviewed on an ongoing basis, revised as needed, referred to as necessary and generally accessible for all to be aware of in their contact with the children and youth. We will teach our children what inappropriate behavior might be and how to respond, in general, within the RE setting and in particular through the OWL (Our Whole Lives) Program. We will always listen to our children. e) a background check, at least at the State level, with additional checks as deemed advisable. Any positive findings from these checks shall be reported to the Safe Congregation team, which will make recommendations regarding the individual in question. The Safe Congregation Policy will be included in the New Member Packet and reviewed at the New Member Orientation. The Safe Congregation Policy will work in collaboration with the Communications Covenant. CVUUS takes seriously the occurrence of any behavior or allegations of behavior that violates these Safe Congregation policies. In order to be prepared for any such occurrences, the Minister shall appoint a Safe Congregation Team consisting of the Minister, President, RE Professional, and three members chosen, where possible, to include at least one member with professional expertise in psychology, counseling, or social work, and/or law. This Team will meet once yearly to discuss these policies and to familiarize its members with them, and will otherwise meet when needed to deal with an occurrence or allegation of occurrence of unacceptable behavior as covered in these policies. The Team will educate itself in legal, denominational, and congregational policies governing requirements for reporting to the congregation, the denomination, and law enforcement and social service agencies. Two distinct situations are considered. 1) An immediate threat to physical safety occurring at any CVUUS activity. a) If present, the Minister will take charge of the response to the threatening situation. b) If the minister is not present, the President or RE Professional, or, in their absence, any member present may respond. c) If the minister is not present, she/he will be notified as soon as practicable after the threat has been dealt with. f) Following any such incident, the Safe Congregation Team will conduct a thorough investigation of the event, and report to the Board of Trustees. If required by law or otherwise deemed advisable, the Team will also report to the appropriate civil authorities. In addition, the Team will be responsible for all communications with the media regarding the incident. a) Allegations of such behavior may be reported by any member of the congregation, any adult participant in a CVUUS activity, any child involved in a CVUUS activity, or the parent of such a child whether or not the parent is involved in the specific activity or in any CVUUS activity. Alleged behaviors should be reported in a timely fashion to the Minister or any other member of the Safe Congregation Team, to the Director of Religious Exploration, or to any Board member. The Director of Religious Exploration or Board member will communicate the allegation at the earliest possible time to the Minister, who will immediately call a meeting of the Safe Congregation Team. At her/his discretion, in case of perceived immediate danger, the Minister may notify authorities immediately. In the case of child abuse, the Minister is a legally mandated reporter. In the event the allegations involve the Minister, the DRE, a Board member, or a member of the Safe Congregation Team, then that individual will not be involved in the investigation in any role other than that of alleged perpetrator. In the event that the allegations involve the Minister, the Board will notify the District Executive and the Unitarian Universalist Association. iv) Except in emergency situations, inform the alleged perpetrator if it is deemed necessary to share information about the behavior in question with those not on the Team, and hear that individual’s response. When sharing information, the Team will be both honest and sensitive to the risks faced by CVUUS in light of the alleged incident. c) The Team will report its findings to the Board of Trustees, with recommendations for a formal CVUUS response. d) If the allegation involves child abuse or other potentially criminal acts, the President or a designated Board member will report to the appropriate civil authorities, provided this has not been done by the Minister as provided for under (a) above. e) Absent specific allegations, the Minister may nevertheless inform the Board or the Safe Congregation Team of potentially worrisome situations. f) During and after the resolution of the situation, if deemed advisable, the Board, in collaboration with the Safe Congregation Team, will be responsible for communicating to the broader congregation and to the media regarding the incident. Such communication will be undertaken at the discretion of the Team and the Board, in consultation. g) In the event of an investigation under this policy, the Board at its discretion may reveal the contents of the file to prospective employers or other institutions making inquiries about the individual involved. h) Following an incident, the Safe Congregation Team will be responsible for developing and implementing healing processes for the individuals involved and for the congregation as a whole.